"Alice Ghostley", by Will Johnson, wjhonson@aol.com, at CountyHistorian.com, professional genealogist copyright 2007-8, all rights reserved. This page is the most complete and thorough biography of Alice Ghostley which exists. It's however not finished. So if you have something to add let me know. Please also visit my version of this article here on Knol and Review it and Rate it! Thanks. 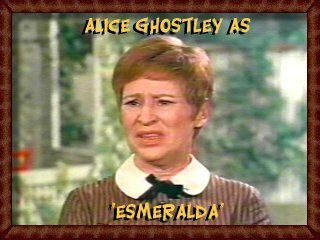 Alice Ghostley was born 14 Aug 1926 in a train station in a place called "Eve" in Vernon County, Missouri as the second child of Harry F Ghostley and his wife Edna M Rooney. Her father was at that time, a telegrapher at this "whistle stop", and shared quarters in the building. Wikipedia reports her middle name as "Margaret", but I don't know on what authority. By 1930, the family had moved to Siloam Springs, Benton County, Arkansas where her father Harry was buried in 1933 having died at a hospital in Missouri that year. She attended school in Siloam Springs through the sixth grade, and then the family moved to Henryetta, Okmulgee County, Oklahoma where Alice finished growing up and graduated from high school. Afterwards Alice went to the University of Oklahoma in Norman, where she majored in English and drama, but dropped out, to move with her older sister Gladys to New York City. Gladys got a job as a secretary at Columbia University, while Alice got her first job as an usher at the Imperial Theatre for $11.88 a week. She studied singing, aiming for a career in that area, but at her 648th audition, as she relates, she was accosted by pianist-composer George Wood. (George hated his first name and so he was always credited as "G. Wood".) He persuaded her, that what she really was, was a comedienne. The two of them begun doing comedy in small venues where she was spotted by Imogene Coca. Imogene's friend Leonard Sillman had been producing an annual revue called New Faces ever since his first one in 1934 which launched the careers of Imogene herself and also Henry Fonda. One source states that it was Imogene who told Leonard Sillman about Ghostley, while another credits Murray Grand with that find. Whoever did it, Leonard put Ghostley in his annual revue New Faces of 1952 where she had a hit with her rendition of the song "The Boston Beguine". New Faces played Broadway for a year, and then toured to a 28-week engagement in Chicago, followed up by stops in San Francisco and Los Angeles. Four of the other aspiring members of the revue that year were Paul Lynde, Ronny Graham, Robert Clary and Eartha Kitt, and one of the writers, in his first work for the Broadway theater, Mel Brooks. The tour was so successful, that "New Faces" was made into a Cinemascope production released in 1954, and Alice again was a co-star as was Eartha Kitt, but Paul Lynde's name does not appear in the advertisement. As amateurs, she and her sister Gladys once did an act together and were given the eerie-sounding billing of "The Ghostley Sisters." Her act, as reported many years later consisted of : "Appearing in horn-rimmed glasses and dressed in a frumpy black sweater, she stumbled across the stage as a bewildered, sexually repressed young woman, crooning to a beguine beat about her ill-fated romance with a Harvard man, underneath a 'Voodoo moon' in Boston." Some sources in error will state that Alice and Felice married in 1953. This is probably based on a bad reading on one of several early interviews which Alice gave. However, the clear indication of their marriage year, is the interview in 1988 stating "the couple will this Autumn celebrate their thirty-seventh anniversary". On Broadway, Alice had parts in 1956's "Shangri-La" a musical. Also and again on Broadway but in an as-yet-unknown-year in "Maybe Tuesday" a comedy. In March 1957 she appeared in the live show "Cinderella", as one of the ugly stepsisters with Kaye Ballard playing the other one, and with Julie Andrews as Cinderella. Watch the "Making of Cinderella" on YouTube Part 1, Part 2, Part 3, Part 4. Note: Alice does not appear in this documentary, but there are long talking-head segments with both Julie and Kaye. Her off-Broadway experience included her role in 1957 as Tom Sawyer's Aunt Polly in Livin The Life. And also a role in a production "Sand Hog" in an undetermined year. On television she played in "Twelfth Night," with Maurice Evans, and also in "The Show-Off". She appeared on the Jack Parr show in 1958/9 and performed for many years in Greenwich Village's Bon Soi, the Blue Angel, and other New York nighteries. She also did a stint of summer stock in New England. In 1960 she appeared in The Thurber Carnival, a revue based on the humorist's writings. In 1961 she appeared with Art Carney in an NBC "Show of the Week" called "Fads and Foibles". In the 1962 film To Kill a Mockingbird, she played Stephanie Crawford the fussy aunt of Dill Harris, and later in 1962 she played on-stage in S.J. Perelman's fantasy The Beauty Part with Bert Lahr, for which she received a Tony nomination. "For three seasons of The Jackie Gleason Show, from 1962 to 1964, Ghostley and Gleason regularly played Agnes and Arthur, two lovelorn residents of a tenement." (The Independent) Watch one episode here on YouTube. For her role as Mavis Parodus Bryson in the 1965 "The Sign in Sidney Brustein's Window" she received a Tony Award as "Best Featured Actress in a Play". She first appeared on the TV-series Bewitched as Samantha's maid "Naomi Hogan" on 6 Jan 1966 in "Maid to Order". This was episode 53 also called episode 17 in Season 2. You can watch the entire episode on YouTube, Part 1, Part 2, Part 3. Note the fascinating bit where Louise Tate's old maid is named... yes ... Esmerelda ! Alice had a small role as one of the greeters at the wedding in 1967's film The Graduate. 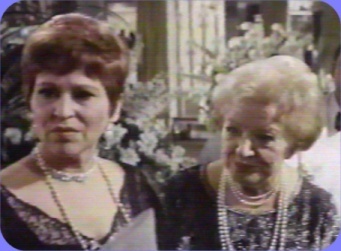 In her longest scene she stands next-to fellow-actress Marion Lorne who she would later replace on the TV-series Bewitched, after Marion's death. Some have seen that as a bit...ghostley. You can watch the entire 48 second clip here. In 1967 Alice appeared in her first full-time TV series as "Mrs Nash" in NBC's new-series Captain Nice for that one season. Alice and Felice moved to Los Angeles, California in 1968 when she states she didn't work for six months. She played Molly the Maid in Doris Day's 1968 movie With Six You Get Eggroll. Alice appeared on "Hogan's Heroes" and "What's It All About World". She had a role in the 1969 movie Viva Max, and that same year she again teamed up with Paul Lynde to appear on the Jonathan Winters show. Alice was a good friend of Maggie Smith and when Smith won an Oscar in 1969 for her starring role in The Prime of Miss Jean Brodie and was unable to attend, Ghostley accepted the Oscar on her behalf. Later Ghostley's character "Esmerelda" was introduced as a regular on the series in 1969, after the May 1968 death of Marion Lorne, the actress who played the lovable-but-befuddled "Aunt Clara". The studio wanted another comedic-actress to be introduced to the series to replace her, but in a different role. Esmerelda is typically summoned when Samantha needs a babysitter. She is a shy bundle-of-nerves who often fades slowly away when nervous. When she isn't nervous her spell-casting is often very good, but when she is nervous all havoc breaks loose. You can watch Episode #170 aka Season 6, Episode 2 "Samantha's Yoo-Hoo Maid" which first aired 25 Sep 1969, and where Esmerelda first appears Part 1, Part 2, Part 3. In this episode, Endora wants Samantha to hire a maid, and suggests Esmerelda who is losing her self-confidence and with it her powers. She fades away when she is nervous, and when she sneezes either something appears for a short while, or somebody is levitated briefly. She appears again in the very next episode #171 aka Season 6 Episode 3 "Samantha's Caesar Salad", when Samantha asks her to make a Caesar Salad, her spell goes wrong, and she gets the Emperor himself instead. Caesar after discovering that history books called him a "Dictator" is so incensed that he refuses to go back and thus Esmerelda's spell won't work. Jay Robinson plays Caesar. You can watch this Episode here Part 1, Part 2, Part 3. In Episode 180 aka Season 6, Episode 12 "Sam's Double Mother Trouble", as Esmeralda is reading a Mother Goose rhyme to Tabitha, she sneezes and the real woman appears. Darrin's mother comes over threatening to separate from Mr. Stephens, then Mr. Stephens comes over and falls for Mother Goose. This makes Mrs. Stephens jealous. You can watch this episode here Part 1, Part 2, Part 3. In Episode 182 aka Season 6, Episode 14 "Santa Comes to Visit and Stays and Stays", Esmeralda brings Santa to the Stephens' home and he can't get back to the North Pole to direct the making of the toys. Samantha rescues Christmas by zapping all the Elves to her house as well. They finish all the toys just in time for Christmas. You can watch this episode here Part 1, Part 2, Part 3. In Episode 184 aka Season 6, Episode 16 "Samantha's Lost Weekend", Tabitha won't eat so Esmerelda hexes a glass of milk that will make the drinker — eat. Samantha drinks it instead, and goes on an eating frenzy. A hilarious side-story occurs when Esmerelda has to get an antidote from the witches' Apothecary while avoiding his randy advances. Instead Dr. Bombay shows up and cures her, but gives her a side-effect of narcolepsy. You can watch it here Part 1, Part 2, Part 3. In Episode 193 aka Season 6, Episode 25 "Okay, Who's the Wise Witch? ", Samantha, Darrin, Endora and Dr. Bombay are all caught in a magical vapor lock around the house due to Samantha's non-use of powers. Esmerelda only appears incidentally. You can watch it here Part 1, Part 2, Part 3. In Episode 197 aka Season 6, Episode 29 "Turn on the Old Charm", Esmerelda again appears only incidentally. The main story centers around Samantha giving Darrin an amulet which makes Endora be nice to him. Esmerelda filches it thinking it's a love charm. Endora now uncursed, curses Sam and Darrin to constantly bicker. Watch it here Part 1, Part 2, Part 3. In Episode 198 aka Season 6, Episode 30 "Make Love, Not Hate", Dr. Bombay makes a love-potion to help Esmeralda get the warlock Norton to fall for her. He drinks the potion, but falls in love with Sam instead. In addition some of it is accidentally poured into some clam dip and everyone at the party tastes it and falls for a different person. Esmerelda falls for Darrin, Mr. MichaelJohn falls in love with his wife but she falls in love with Larry. Watch it here Part 1, Part 2, Part 3. In Episode 204 aka Season 7 Episode 6 "Paul Revere Rides Again", An antique Paul Revere teapot is taken by Esmerelda, who pops in Salem to bring Samantha's souvenirs home. Sam wants Esmerelda to return the Paul Revere teapot, but her spell returns Paul Revere himself. Revere thinks that it is still 1776. In Episode 224 aka Season 7 Episode 26 "Samantha's Magic Mirror", Sam gives Esmerelda a make-over and then enchants all the mirrors to make her look more fabulous. In Episode 230 aka Season 8 Episode 4 "Samantha's Not-So-Leaning Tower of Pisa", the Stephens take a vacation to Italy. Esmerelda pops in to straighten the Leaning Tower of Pisa. Read my write-up on "Every episode of Bewitched" on Knol, where you can buy or watch most of the 254 episodes. In it's third season in 1970, Alice became cousin "Alice" on the TV-series Mayberry, R.F.D. starring Andy Griffith, after the "Aunt Bea" character was written out of the script. She played in this role for one year. Alice and Felice in 1970 moved into their first house in the Hollywood Hills, previously having rented, mostly living in apartments in New York City's Greenwich Village neighborhood. In 1971 she appeared with Patty Duke in the movie Two on a Bench, you can watch an excerpt here, as the kleptomaniac mother. Very funny. From 1969 to 1973, she appeared in five episodes of Love, American Style. In 1973 she again teamed up with Julie Andrews, playing her roommate and foil, in the ABC "The Julie Andrews Hour". Watch it here on YouTube. (Note: Alice appears only for the few few minutes, the rest is Julie dancing and singing.) Alice appeared in 1976's film Gator starring Bert Reynolds. She appeared as "Mrs. Dodds" in three episodes of the TV-series Good Times (with J.J. Walker), playing an adoption agent. You can watch her in this role here, she begins speaking at time 7:50. It's just a tiny bit saccharin so you've been warned! In 1978 she took over the role of Miss Hannigan, the alcoholic matron of the orphanage, in the long-running Broadway play Annie. Alice appears here on YouTube in an undated "children's" show with Charles Nelson Reilly and Jonathan Harris (that guy who played the evil Dr. Smith on the TV-series Lost In Space). She played shop-teacher Mrs. Murdock in the 1978 movie Grease starring Olivia Newton-John and John Travolta. You can see her here on YouTube. She was also in the 1978 movie Rabbit Test with Paul Lynde which was very bad. In 1986/7 she became a regular on the TV-series Designing Women as the eccentric "Bernice Clifton", appearing in 33 episodes, for which she received an Emmy nomination in 1992. She appeared sporadically on that show until the show was cancelled in 1993. Watch one of her most memorable episodes here on YouTube, and another one here. As Irna, she appeared in six episodes of the TV-series Evening Shade. In 2000, she appeared in four episodes of the TV-series Passions. Her husband Felice died 21 May 2003 from lung cancer, and Alice died at her home in Studio City, California on 21 Sep 2007 after a battle with colon cancer a series of strokes. 1920 Census of Corozal, US Military Forces, Panama Canal Zone showing (among others): "Harry F Ghostley, 35, MN/England/NJ, Single"
1930 Census of Siloam Springs, Benton County, Arkansas showing : "Harry F Ghostley 44, married first at 35, MN/NJ/MN, telegraph operator; Edna M 39, married first at 30, OK/IL/IL; Gladys R 8 OK; Alice M 6 MO"
New York Passenger Lists, 1820-1957, 14 Oct 1929 showing : "Felice Antonio Orlandi, age 5, born Avezzano, Italy"
The Lawton Constitution-Morning Press, 22 Jan 1967, "Alice Ghostley Says : Prove Yourself: Do Everything..."
The Bridgeport Post, 27 Feb 1969, " 'New Faces' Stars Help Jonathan As Supporting Members of His Cast"
Social Security Death Index showing : "Felice Orlandi born 18 Sep 1924, died 21 May 2003 last residence Studio City, Los Angeles County, California; SSN issued by Ohio"
Social Security Death Index showing : "Alice Ghostley born 14 Aug 1923, SSN issued by Oklahoma, died 21 Sep 2007, last residence Studio City, Los Angeles County, California"
Harry F Ghostley (AFN 21FQ-2V7) was born 10 May 1884 in Minnesota to Harry Ghostley and his wife Margaret Anna Walker. Harry is living with his widowed mother in the Special 1905 Minnesota State Census. By 1910 Harry has moved to Portland, Multnomah County, Oregon where he is listed as single and a boarder. By 1920 he is in the US Panama Canal Zone evidently in the armed forces. That year or the next, he married Edna Rooney. Between 1922 and 1924 the family moved to Eve, Vernon County, Missouri where that year their daughter Alice was born. By 1930 they had located in Siloam Springs, Benton County, Arkansas. 1910 Census of Portland, Multnomah County, Oregon showing : "Harry F Ghostley, 25, MN/England/MN, Boarder, Single, Operator, Telegraph"
Missouri Death Certificates 1910-56 showing : "Harry F Ghostly, died 23 Oct 1933 at St Mary's Hospital, Kansas City, Jackson County while a resident of Siloam Springs, AR. Wife Edna, born 9 May 1886, Station Master K.C.S., born Minnesota, father Harry Ghostly, mother Margaret Walker, Informant Mrs Edna Ghostly of Siloam Springs, AR, died of Carcinoma of the liver, Autopsy Yes, burial at Siloam Springs"
Oak Hill Cemetery (aka Siloam Springs cemetery) listings showing : "Ghostley, Edna M., d 1965 Siloam Springs; Ghostley, Harry F. 1886 1933 Siloam Springs"
Edna M Rooney was born in 16 Sep 1890 in Oklahoma, daughter of Ed Roony and Alice. In 1920 or 1921 she married Harry F Ghostley. They had two children by the time they were enumerated in Siloam Springs, Benton County, Arkansas in the 1930 US Census. Harry developed Carcinoma of the Liver and died in a hospital in Kansas City, Missouri in 1933. Edna outlived him by 32 years, dying in May 1965, having last resided in Oklahoma. They are buried side-by-side in Oak Hills Cemetery (aka Siloam Springs Cemetery) in Benton County, Arkansas. 1900 Census of Gallup, Bernalillo County, New Mexico showing : "Ed Roony 32; Alice 28; Mamie 10; Ednas 9; Agnes 7; Munie 4"
1910 Census of Coalgate, Coal County, Oklahoma showing : "Edd Roony 42; Alice 38; Mamie 20; Edna 19; Agnes 17; Minnie 14; Ruth 2"
1920 Census of Kennady, Le Flore County, Oklahoma showing : "Edna Rooney, 27, Single, Boarder, OK/IL/MO"
Social Security Death Index showing : "Name: Edna Ghostley, Last Residence: Oklahoma, Born: 16 Sep 1890, Died: May 1965, State (Year) SSN issued: Oklahoma (Before 1951)"
Harry Ghostley (AFN 21FQ-2QD) was born 28 Jan 1844 in Berkeley, England. He married Margaret Anna Walker on 28 Jan 1874 in Minnesota. Harry and Margaret had four children: Edith who died age 1 on 12 Aug 1875, Edith born 2 Nov 1875, Ella born 2 Sep 1877, Harry born 10 May 1884 and Gladys born May 1888. Harry Ghostley died Sep 1887 in Minnesota. Margaret Anna Walker (AFN 21FQ-263) was born 26 Aug 1851 in Hanover Neck, Morris County, New Jersey to Richard Westbrook Walker and his wife Eleanor Shields. She married Harry Ghostley on 28 Jan 1874 in Minnesota. She outlived her husband Harry by almost 58 years, dying on 30 Jun 1945. 1920 Census of Henry, Okmulgee County, Oklahoma "Edd Rooney 57, Alice 48, Minnie 22"
This page was last modified on 25 January 2010, at 01:02. This page has been accessed 376,891 times.